But my slothfulness prevents me from going to Thee. but Thou always findest me engaged in acts that prevent Thy remedies from rendering me their healing power. O Lord, enlighten and sober me. Cure me and I will be cured. Quote taken from Facebook group "OrthodoxSpirituality"
A key to progress in the Christian life is honest self-appraisal and self-condemnation. The rain falls on the evil and the good, but it only soaks into “good ground” that has been carefully prepared. Our laziness prevents us from preparing our ground as we should. The major reason for our troubles is ourselves! How can God be responsible? He wills that all men be saved and come to knowledge of the truth. The world, and also worldly Orthodox do not understand this. This is the Christian way; it is the royal path; it is recognition of reality. Do not listen to the siren song from the world about “self-esteem” and all the rest. The happy Christian recognizes that he is nothing, and yet, because of God, he can be holy in everything. If only Orthodox Christians would have a healthy understanding of monasticism, which teaches us how to think! In the parish it is not about some kind of foolish obedience to sinful and inexperienced guides, but a reordering of our priorities, according to the exploits and example of our Holy Fathers who inspire us. So many of our political, cultural and moral problems in Orthodoxy today are directly because too many in our church, (including many bishops!) have abandoned the monastic perspective on life, and the monastic rigor. This entry was posted on Friday, November 19th, 2010 at 12:00 am and is filed under Gleanings, Pastoral Journal. You can follow any responses to this entry through the RSS 2.0 feed. You can leave a response, or trackback from your own site. "He is no fool who gives that which he cannot keep, for that which he cannot lose." is a quote from a man who was martyred for his faith a short time after having penned this in his journal. The monastic call is simply a call to lay down, 'in due season', all that which I will eventually lose, anyway. The world is passing away and will soon be lost. If I do not come out of it, I will be lost with it. One way or the other, the illness caused by my love of the things of this world will end. Either I will follow my Physician's remedy for healing and be cured—or I will die. 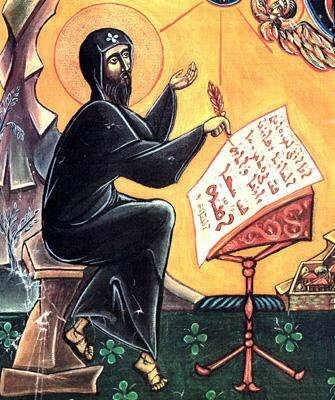 Thank you for the prayer by St. Ephrem the Syrian. It is so relevant to us all. We're running around trying to get everything accomplished and hardly stop to say thanks to the Lord, let alone wait for Him to advise us and guide us.